The PM wants to move the UK's exit date from Friday to 30 June - but leaders are split over the length of delay. 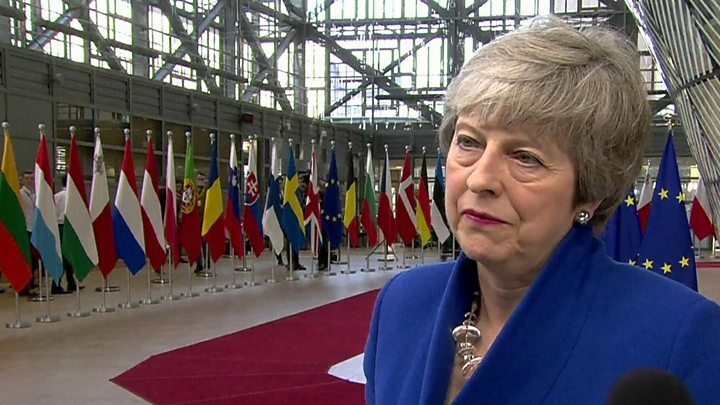 Earlier Mrs May said she "regretted" that the UK had not already left, adding that she had "been clear" with the EU that she was only seeking a short delay to Brexit. Ahead of the summit, European Council President Donald Tusk said "neither side should be allowed to feel humiliated" and urged the other 27 leaders to back a flexible extension of up to a year. Mrs May said the UK could leave the EU whenever a deal was ratified by Parliament - meaning the exit date could be by 22 May - the day before the European Parliament elections. It is absolutely clear at the moment what happens next to her - and what happens next at home - is not in British hands tonight. The EU's chief Brexit negotiator, Michel Barnier, said the "only way to ensure an orderly withdrawal of the UK" was for Parliament to agree the withdrawal agreement, and any extension "has to be useful and serve a purpose". 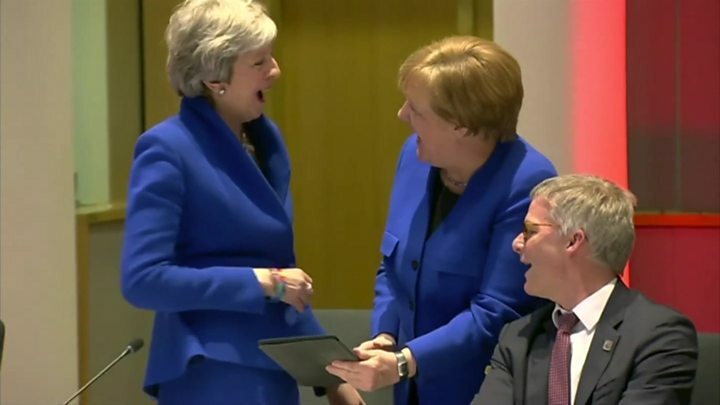 Mrs May said she knew many people would be "frustrated that the summit is taking place at all", but its purpose was "to agree a deal to enable us to leave the EU in that smooth and orderly way". She said the extra time to get a deal through Parliament was "in everybody's interest". Asked if she would accept a longer extension, she said: "I have asked for an extension to 30 June. The PM has previously said she was "not prepared to delay Brexit any further than 30 June". EU officials prepared a draft document for the leaders to discuss at the summit - but the end date of the delay was left blank for them to fill in once deliberations ended. BBC Europe correspondent Kevin Connolly said "much has been spelled out in advance", including the condition that the UK would have to hold European Parliament elections if it remained in the EU at the end of May - or else be forced to leave immediately. The UK would also be expected to commit to not disrupting EU business - such as the preparation of the next budget - and its influence "would be sharply reduced and its voice muted". Arriving in Brussels, German Chancellor Angela Merkel said the leaders needed to discuss Mrs May's request "openly and constructively", and she had "no doubt" there would be unity over an extension. She said: "The greatest interest for us is an orderly withdrawal of the UK from the EU and to maintain the unity of the 27." Irish Taoiseach Leo Varadkar said he did not anticipate that the UK would leave the EU on Friday, and he was "very confident" that an extension will be agreed at the summit. "What is still open is how long that extension will be and what the conditions will be," he added. But French President Emmanuel Macron said "nothing is settled, and in particular no long extension". He said he was "impatient" to hear "clear proposals" from Mrs May, and leaders would need "a lot of calm, a lot of determination and a lot of sang-froid". President Macron added: "I believe deeply that we are carrying out a European rebirth, and I don't want the subject of Brexit to get in the way of that." Ms Foster said the prime minister had "limped along and tried to force people into a cul-de-sac" in trying to get support for her "bad" deal.